A Blog on Martial Art Technique and Philosophy With Emphasis on (ITF) Taekwon-Do. Simply put, “verticality” refers to up-and-down movements, usually achieved through the bending and straightening of the knees. However, this “verticality” doesn’t always have to involve the knees; for instance, apart from using the knees, in Korean traditional dance, the “verticality” is often emphasized by the lifting and dropping of the shoulders. “Verticality” is also noticeable with Korean drummers while seated, so as a concept it can be any type of up-and-down movement of the body. The Korean term used for how this “verticality” is accomplished is gulshin dongjak 굴신 동작, which can roughly be translated into English as “springiness” or “elasticity”, although more often as “bending and stretching” or “extension and contraction”. The sine wave motion has brought to ITF Taekwon-Do these two elements: a clear sense of verticality and a three beat rhythm. Thus, I disagree that the sine wave motion was simply “created” to discredit non-ITF practitioners. No, the sine wave was “created” to make Taekwon-Do a truly Korean martial art, rather than just a rebranding of Karate. The sine wave is one of many deliberate changes made by General Choi in his pursuit of creating an authentically Korean martial art. A part of me want to be so rash as to say that if you practice Taekwon-Do as a Korean martial art, then gulshin dongjak should be part of your system, whether it is the “ITF sine-wave Tul motion” or the “WTF free-sparring stepping/hopping motions”, which according to Dr Kimm both “come from the same type of traditional Korean body culture” (p. 80). If you do not want to do gulshin dongjak, maybe you should rather do Karate, which follows Japanese body culture based on Shintoism. A final thought on the idea that the sine wave motion was “created” by General Choi: I think the aforementioned discussion on traditional Korean body culture makes it clear that what we refer to as the sine wave motion in ITF Taekwon-Do was not “created” by General Choi at all, but instead is part and partial of traditional Korean body movement, and that General Choi only appropriated this into Taekwon-Do; he didn't invent it. So-what if ITF Taekwon-Do's sine wave motion is an embodiment of traditional Korean movement as seen in other Korean activities such as traditional Korean dance—does the sine wave motion have any practical combative value? To conclude, the sine wave motion was used to differentiate between General Choi's Taekwon-Do and other Taekwon-Do; however, that was not the reason for its inclusion in ITF Taekwon-Do. The purpose of the sine wave motion, I am convinced, was to make Taekwon-Do authentically Korean by including two elements that are essential to traditional Korean body culture: verticality and a three beat rhythm. Furthermore, when correctly understood and appropriately applied, the sine wave motion does have practical, combative benefits. Footnote 1: While Alex Gillis doesn’t say that the sine wave motion was created specifically for discrediting other Taekwon-Do practitioners, such a reading is easy to come to, because the preceding paragraph states that the pattern Ju-Che was designed as a gift to communist North Korea, and that the sine wave motion which was used to discredit other Taekwon-Do instructors was also a gift to the North. My opinion is that although the sine wave motion may have been used as a political tool to discredit certain people, that was not the reason for its creation. Gilles, A. 2016. A Killing Art: The Untold History of Tae Kwon Do. Updated and Revised Edition. Kimm, H. Y. 2013. Taekwondo History. Seoul Selection. Korean Dance: Pure Emotion and Energy. 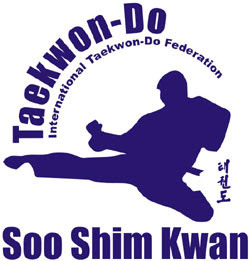 The Soo Shim Kwan is an ITF Taekwon-Do association with members in South Korea, South Africa and elsewhere, with appropriate affiliations in ITF Taekwon-Do, Hapkido and Taekkyeon. Soo Shim Kwan 水心館 / 수심관 can be translated as “House of the Calm Mind”: Soo 水 is understood as water, clear and calm and Shim 心 as heart or mind. The name Soo Shim 水心 can therefore be interpreted in various ways, e.g. "To be like water"; "To have a Calm Mind"; "To have a Clear Conscience". With our main dojang connected to a university (North-West University, Potchefstroom, South Africa) we consider ourselves an academic association and enjoy exploring the science and philosophy behind Taekwon-Do and the martial arts. The BIG explanation for ITF Taekwon-Do's "sine wave motion" you have been looking for! See a list of other blogs at the bottom of the Links-page.